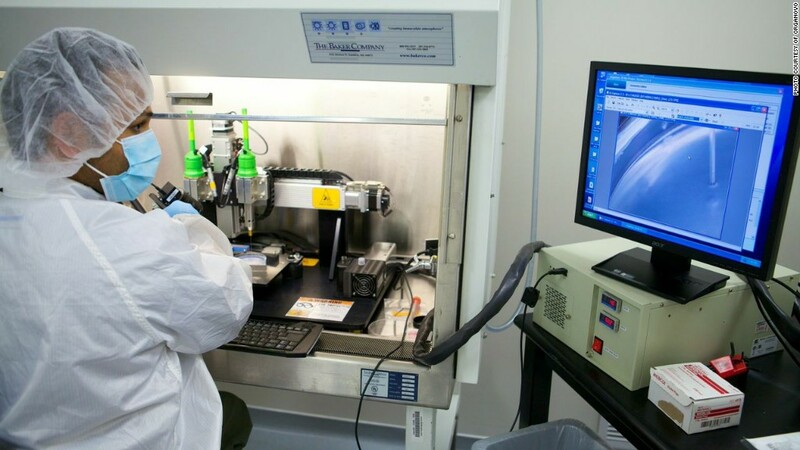 An Organovo engineer oversees the tissue-printing process. Add one more to the growing list of 3-D-printed products: human organs. California-based biotech firm Organovo (ONVO) is set to begin selling 3-D-printed liver tissue by the end of the year, part of the growing movement to bring the technology to the medical field. Organovo can't yet print a fully functioning liver. But the company has already been working with a handful of laboratories to manufacture live liver tissue, offering scientists a new way to conduct research. "This gives researchers the kind of tool that they just haven't had in the past," said Michael Renard, executive vice president at Organovo. "They can't do the kind of experiments on a person that they can do with this tissue in a lab setting." Within the next few years, Renard says 3-D-printed tissues could also be used in patient treatment, to replace small parts or organs or encourage cell regeneration. The process starts when scientists grow human cells from biopsies or stem cells. They then feed the cells into special printers that can arrange them three-dimensionally by cell type in the way that they'd appear in the human body. Renard didn't want to speculate on when the printing of whole organs might become a reality, but many researchers are excited about the possibility and its implications for transplant procedures. The technology has already been used to make functioning prosthetics and replacement bones. But organs, which comprise many different types of living cells and need nourishment from the circulatory system, are a more difficult proposition. That hasn't stopped scientists from trying, however. Harvard researchers are at work trying to print functioning human kidneys, while a team at the University of Louisville is trying to produce a 3-D-printed heart. There's still a lot more research to be done -- and regulatory approval to be secured -- but researchers at Organovo and elsewhere are feeling optimistic. "We believe this technology could very much be transformational," Renard said.